else realizes it's the smart thing. 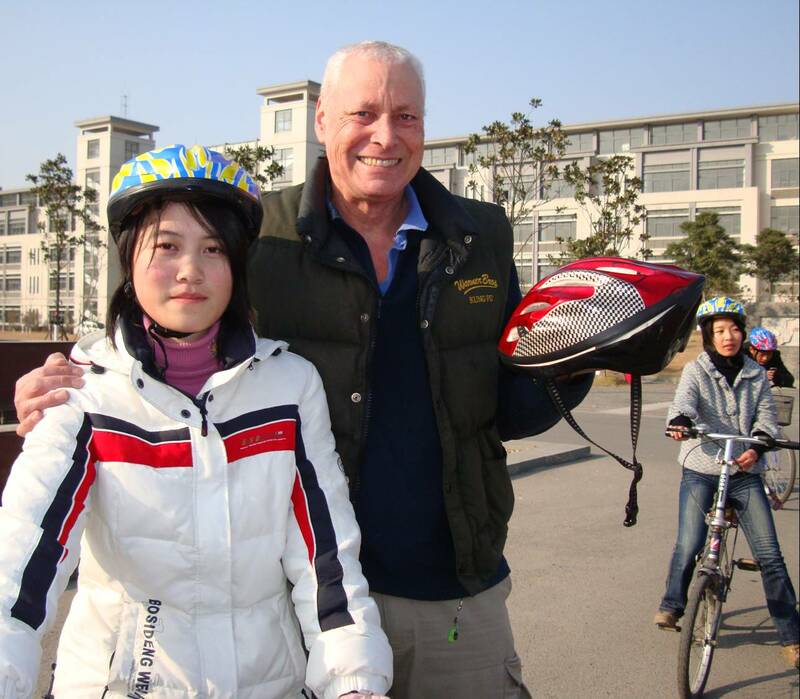 As all of my students know by now, I've taken it on myself to promote the use of bicycle helmets in China. Here are a few of the highlights of this campaign. We had a wonderful barbeque dinner on the street this evening. When we returned home we got a surprise visit from William, our old friend and Chinese teacher. He'd been talking to his younger brother about my helmet campaign, and his younger brother, who is about to do some cycling around the lake here, decided he wants a helmet. Yes! (pumps fist in air). 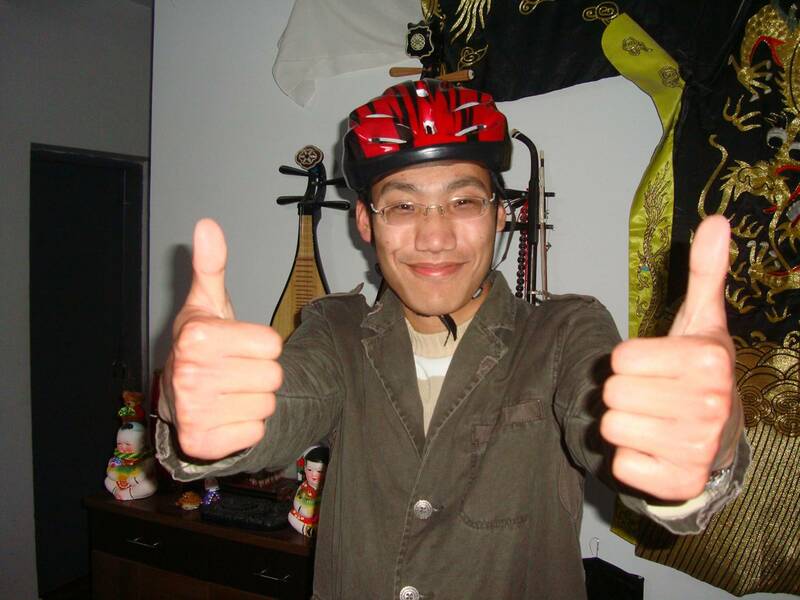 A young Chinese who voluntarily wears a bike helmet. Fantastic. I asked William's younger brother if he would be riding with a friend, and of course he will be. So of course he will need two helmets. I really should be working in retail. Today Edward came to see me to pick up two helmets that he has sold to other students. He's decided to support my helmet promotion project by selling them himself. What a thrill this is for me, to have a student take up this cause on his own initiative, with no prompting from me at all. It gives me hope for humanity. 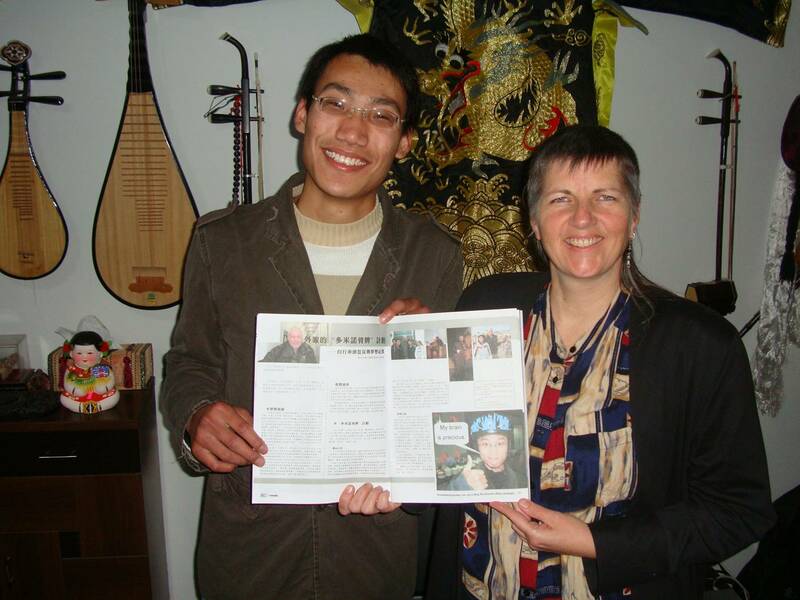 Today one of my students, Edward Hou in my IELTS preparation class, presented me with a copy of Lihu Magazine, the all-student produced Jiangnan University news magazine. It's a slick and professional publication. More to the point, this issue devoted four whole pages to me and my helmet campaign. Wow. Thanks guys. I really appreciate the attention and recognition. Most of all, I appreciate that Edward came over to my home to buy a helmet. On Wednesday of this week I was interviewed for an article in the Yangtze Evening Post, the most popular Chinese language evening paper in Jiangsu Province. Yesterday the article came out. It was better in the actual paper, because that included a picture. But at least it's here. Here's the picture that they didn't post with the online article. 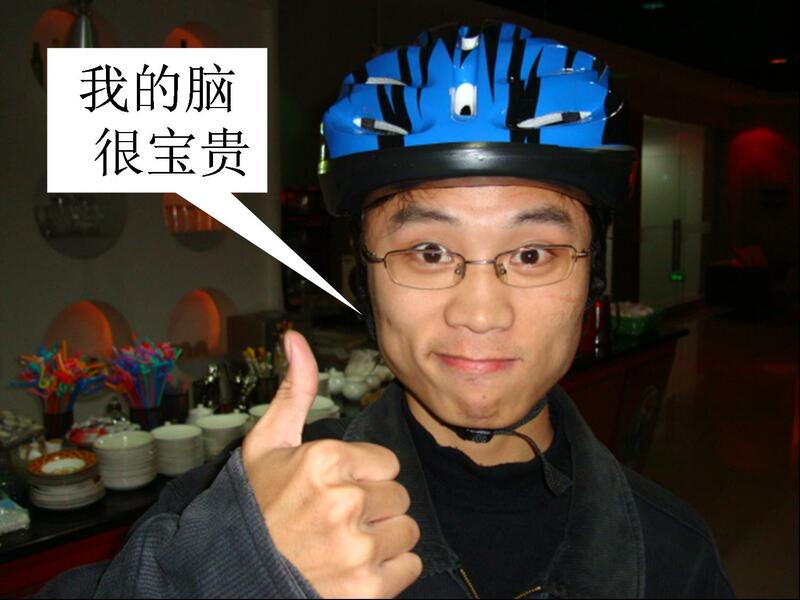 It's really encouraging to see how the Chinese media is picking up on the bicycle helmet idea. Now I think I need to talk to the doctors in China who deal with brain injuries, and get them on board this campaign. 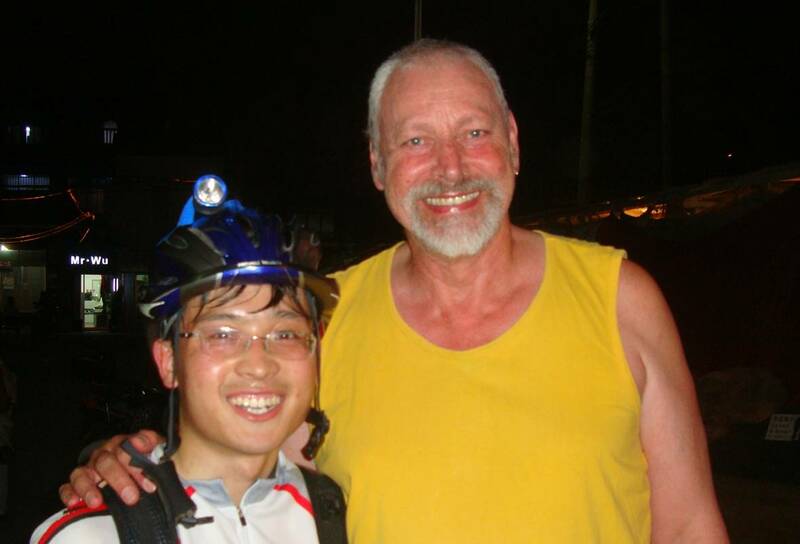 On our way back to Wuzhishan on the mountain highway of Hainan Island, Ruth spotted a bicycle rider coming toward us. "Hey, somebody in China wearing a helmet," she said. "That's great." 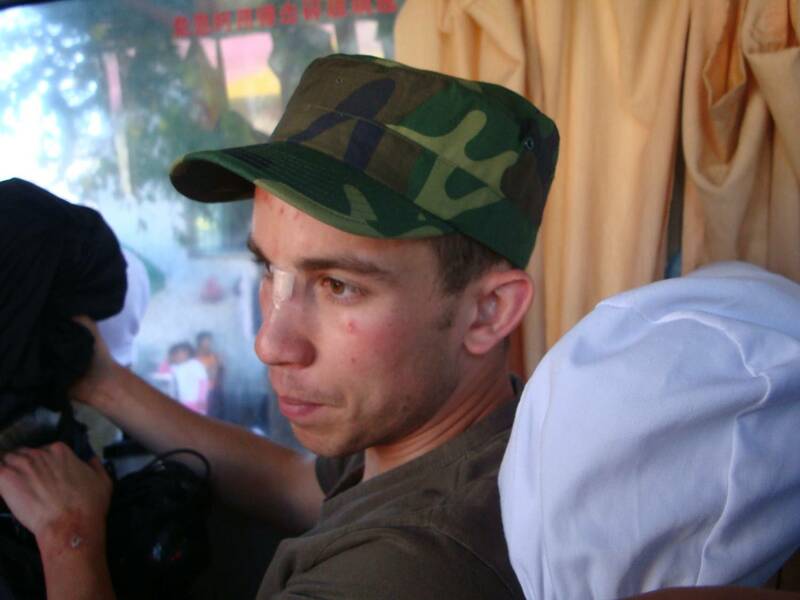 We're always on the lookout for Chinese bike riders who wear helmets. We're hoping that the idea is catching on and spreading. "He looks American or European," I said. "No, I think he looks Chinese." 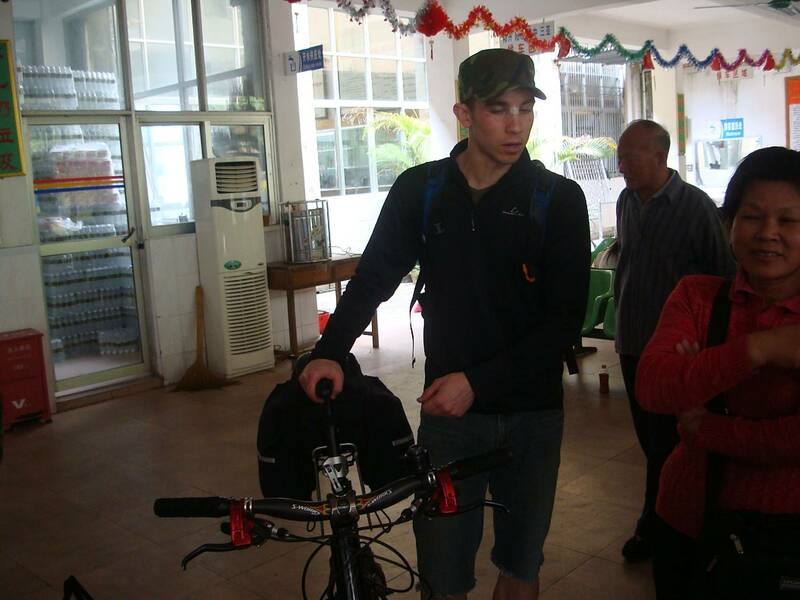 The next day, getting ready to board the bus back to Sanya, we saw him at the bus station with his bicycle. He's a serious bike rider from Boston, Massachusetts. He spoke excellent Mandarin, and he needed it to convince the bus driver to load his bike into the baggage compartment of the bus. I noticed a bandage on his nose and some road rash on his face. "Where's your helmet," I asked. "I broke it this morning," he said. "Wow. Imagine what you would look like if you hadn't had the helmet." "Yeah. I'm a firm believer in helmets. Probably save my life this morning." Somebody had removed a manhole cover, and there was grass around it that hid the open hole from view. That's what he hit. Fortunately, he was wearing a helmet. 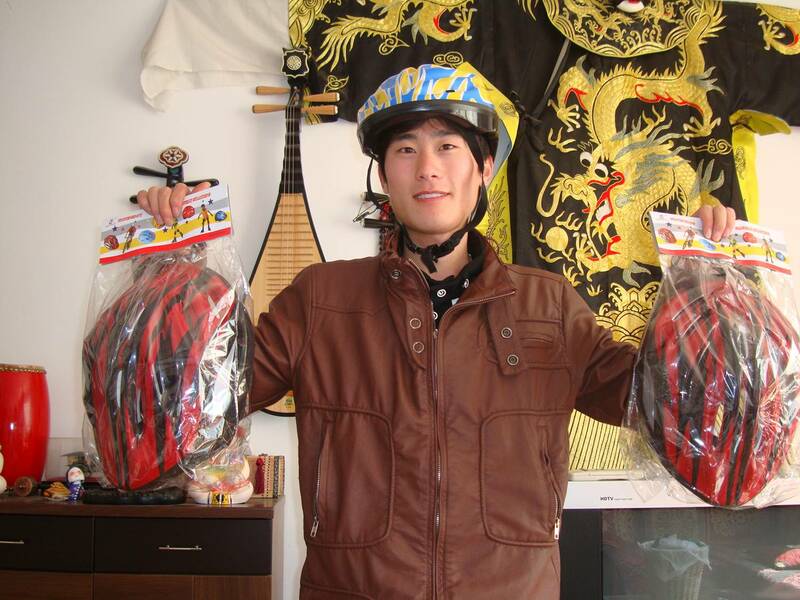 If he'd been a Chinese rider, without a helmet, he'd probably be one more reason why the bicycle fatalities are seven times higher here than in North America. A Legend in His Own Mind - The China Daily article. Our first national publicity for the helmet initiative. This was beautiful. A tiny picture on the front page, directing readers to page 10, where we had a huge picture and almost the whole page. 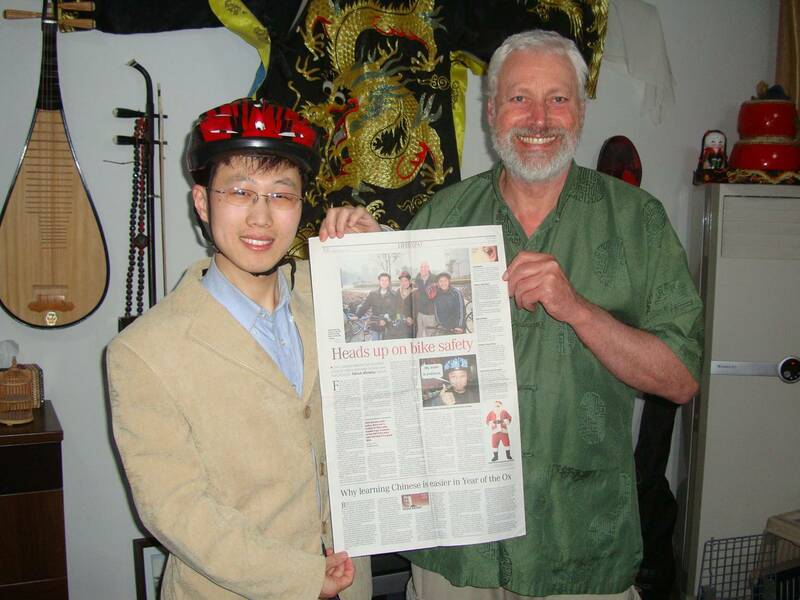 A Legend in His Own Mind Part 2 - The Yangtze Evening Post Article: Getting the news out to the Chinese people in the most popular evening paper in Jiangsu Province. You know what, I still remember the first time I saw you (of course you didn’t know me that moment). I laughed, and said: ”how funny!” I don’t mean to laughed at you, I just feel surprised to see a man who is just riding a bike on a peaceful campus wearing a helmet! for me, for most students who ride to school every day, it’s not necessary. first, we don’t see how dangerous it is; second, we don’t want to cost that much (maybe 100yuan or more?) for a useless thing; third, it will take us time to wear and it obviously may make annoy our hairstyle (it’s terrible! ); last but not least, it make us outstanding, and maybe we will be laughed at just like you and Ruth. Thank goodness, I give up those stupid opinions now! After surfing on your page and listening to you, I think I can accept it now~ and many thanks, David, you help us to find how important our head are. ye, you got it, thanks for reminding us we every one could have our own thought! Just gotta love my students. They are what this is all about, after all. This is the second Chinese person I've seen wearing a helmet. I told him he's very smart to protect his brain. I dropped the ball on this campaign last year, and did nothing for two terms. But my energy has come back, and I'm excited again. We can make this happen. The other day Ruth and I saw two bike riders on the Jiangnan University campus wearing helmets, and they weren't riding together. That's a first, and a start. I've also started to network with other interested people on the helmet issue: Here's a link to the Bicycle Helmet Safety Institute, a great stateside site promoting bike helmets. Any questions you have about whether wearing a helmet is a good idea can be answered here. There's also a lot of information about how to campaign for helmet use, and what is happening globally on this issue.